Oh god, something horrible is going to happen to Dog, isn’t it? Each week, we comb through the guts of The Walking Dead, much like a horde of hungry walkers, to bring you the episode’s best moments, surprises, and other post-apocalyptic curiosities. 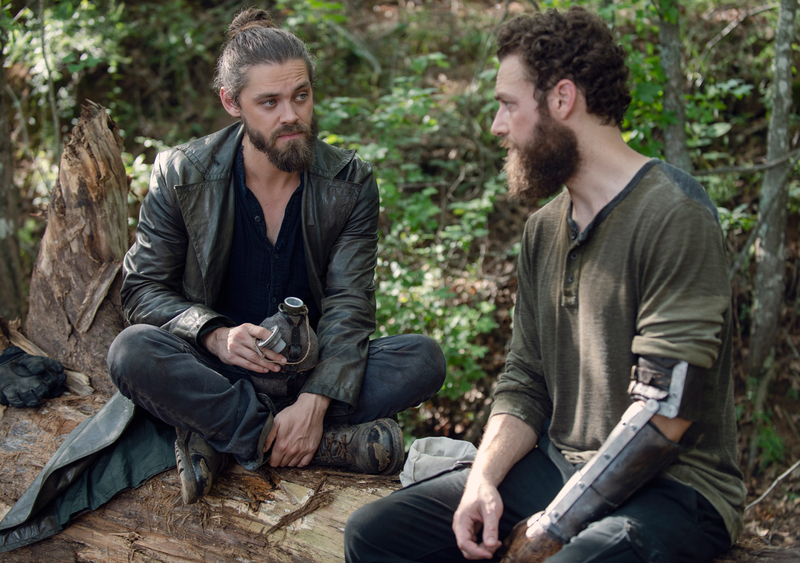 This week: Hunting with Daryl, hiking with Michonne, and sparring with Jesus. Blast from the past: This week’s episode was directed by Michael Cudlitz, who previously played Abraham on the show. Best new character: Dog, the dog. 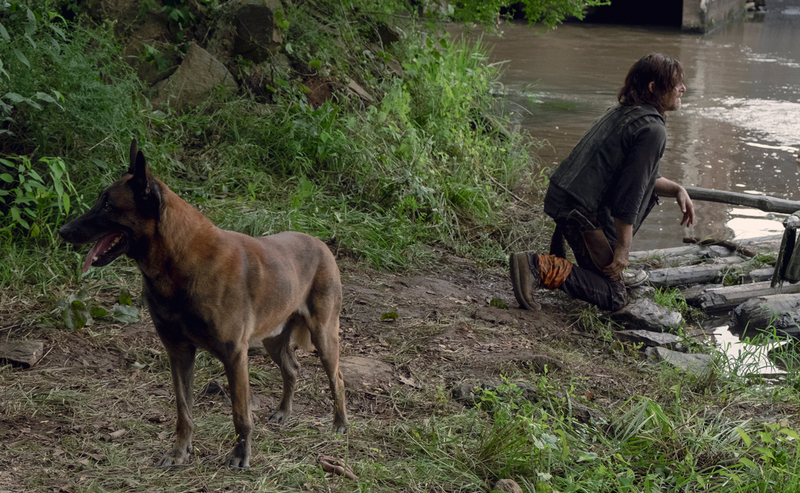 Wish, granted: Daryl having a dog is not a brand new idea. In fact, way back during a panel at Walker Stalker Con Atlanta 2015, when Norman Reedus was talking about crafting Daryl’s character, he said, “There are many times on this show where I think, ‘I should have a dog!’ And [the writers] are like—‘Nope.’” Guess the writers finally gave in. Biggest disappointment: We had been looking forward to meeting Hershel Rhee this week, only to find out he disappeared with Maggie off to Georgie’s mysterious colony. Maybe next season? Best repurposing: The “wagon” pulling the new crew to Hilltop is actually the back of an old pickup truck. Best fashion choices: We don’t care, Bernie’s paisley shirt was awesome. Jesus and Aaron keep the peace. Best diplomatic relations: We’re glad that Jesus and Aaron have a diplomatic back channel despite the apparent Alexandria/Hilltop cold war. Most expensive mistake: Michonne’s slicing into the Stadivarius violin has overtaken Rick’s bridge explosion has the most expensive thing destroyed since we’ve been keeping track. Worst instruments: Of the three that were mentioned in this episode, two—the recorder and the kazoo—are perhaps the most annoying ever invented . . . unless of course Luke also has a vuvuzela in his collection. Missing-in-action: One of the famous angel wings has been ripped from the back of Daryl’s vest. Biggest question: With only one episode left until the winter break, we’ve now got two characters sporting X-shaped scars—Michonne and Daryl. Here’s hoping that we won’t have to wait long to figure out what exactly happened during the six-year time jump. Second biggest question: How does Daryl’s motorcycle still have fuel? Tara: There’s a noise complaint from trailer seven . . .
Jesus: Why did you give that kid a kazoo? Tara: You find a kazoo, you give it to a kid. Most disturbing image: Dog trapped with a group of walkers closing in. He can’t die, he’s a good boy! Best kill: It took one good arrow from Yumiko to bring down that giant piece of aluminum sheeting, blocking the walkers from attacking the horses. Daryl would be proud. Episode MVP: Tara. While we agree that Jesus needs to keep communications between Alexandria alive (and training Aaron isn’t a terrible idea either), Tara knows that Hilltop needs a present leader to keep things running smoothly. We think a vice presidency is in order.